California winemakers are dabbling with Sangiovese, Barbera and sometimes Dolcetto and Nebbiolo, but few have explored the realm of the Lagrein grape. Our tasting, as we move into warmer weather, featured a number of young, fruit-driven wines with a trio of wood-aged, cellar-worthy bottlings for comparison. The Lagrein grape is being cultivated in California presently. As of the 2005 growing season, there were 95 acres bearing fruit here in the Golden State. The grape finds its home, however, in the Alto Adige and Trentino regions of Italy. There's a sector of the Bolzano area called "Gries" that's the hotbed of Lagrein activity. A reference point for the wine has been the monastery winery called "Muri Gries" and their Abtei-Muri bottling is considered a benchmark for Lagrein. The grape had not been cultivated with much care by the vast majority of growers until the 1990s when people started to grow the grape with more care. Lower yields allowed winemakers to have fruit which could be vinified into a deeper, darker, more complex red wine. Our set of wines featured a number of good, reputable growers/winemakers entries, along with a grower's cooperative winery from the Trentino town of Lavis, some 30 miles south of Bolzano. 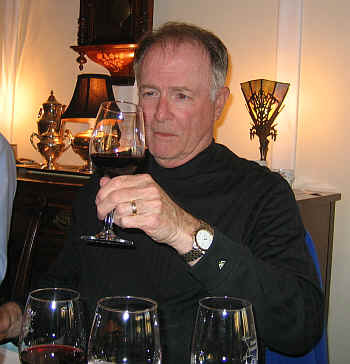 As a group of wines, we found many good quality and very drinkable wines. The benchmark bottling of Abtei-Muri finished in second place when two tasters pegged this as their least favorite wine, otherwise it would have won the tasting. This allowed the least-costly bottling of the tasting, the wine from the Lavis co-op, to win the tasting. The second place wine finished only 7 points ahead of the 6th place finisher, so you'll note how tightly bunched the numbers are. Deep in dark ruby, this wine offers a nice bit of toasty oak with plenty of black fruit aromas...the nose is very attractive, but the wine is a bit austere on the palate. I've had a number of bottles of this wine and each has been quite good and delicious, but the dynamic of a wine-tasting was less kind to this bottle. It's not flawed in any way, but is simply a bit tannic, tart and simple. With food, this has been a very satisfying bottle of wine. Go figure. The initial fragrance of this deep ruby-colored Lagrein was typically berryish, but as the wine sat in the glass it took on an odd acacia-honey aroma with weedy undertones. I marked it down for having more tannin than it needs for the level of fruit on the palate. Perfectly standard and reasonably drinkable, but it's not a wine for a beauty contest such as this tasting. I liked the dark berry fruit of this wine. It's a good, typical Lagrein with a modest amount of tannin. I did not find it quite as attractive on the palate as it is on the nose, though I'm sure it would be a nice wine with food. With medium-deep ruby color, I found the aromas of the Tiefenbrunner wine to be exceptional. There's a wonderful perfume reminiscent of black cherries and just a whiff of a woodsy note on the nose. 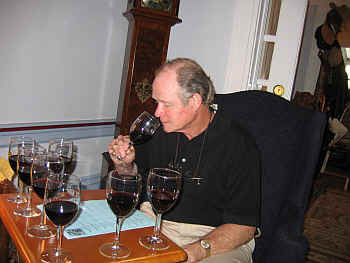 Medium-full on the palate, the wine has plenty of fruit on the palate to balance the tannin. It's delicious now and should remain in good shape for a few years. One-and-a-half stars on my three star scale, no stars being a standard bottle. The Waldgries wine has a fully saturated dark color to it. The aromas are very attractively fruity, showing tons of blackberry notes and a mild streak of cassis. It's hugely aromatic and, for me, extremely charming in the glass. The same notes shine brightly on the palate, with lots of deep berry fruit and it's quite dry and nicely acidic. The flavors linger nicely and it's a most attractive wine. I am looking forward to trying this fellow's other Lagrein wines (he makes an entry level bottling and a wood-aged offering that often gets good reviews in Italy. Two stars for this wine! With medium intense ruby red color, this wine has berry fruit up front competing with a brambly and herbal tone. Had it shown more berry, I'd have been more of a fan. The wine seemed a bit flat on the palate, which took it down in the ranking for me. I described it as a bit of a 'farmer's wine," as it lacked the polish and brilliance or freshness of fruit I found in many other wines. It's a suitable "spaghetti red," but nothing special in my view. I'd give it a one-half star rating. The benchmark Lagrein would have won the tasting had not two of the ten tasters ranked it last. It's dark in color and as youthful in its hue as are the much younger bottlings. I found attractive blackberry fruit on the nose and a mildly woodsy fragrance. Medium-full bodied, there's a whiff of a leathery flavor on the palate which for some will be in the column of 'complexity,' and for others a distraction. I gave it a one star+ rating and, having had this wine with dinner, can say it's a marvelous bottle with grilled or roasted meats. I am certain some people will read this page a smirk thinking that these tasters couldn't possibly be capable since they ranked a 'lowly' wine from a large grower's cooperative winery ahead of far more prestigious bottlings. Yet this wine, from the Trentino region south of the Alto Adige, was a lovely little wine. It offers a deep ruby color. I did not find the nose as expressive, frankly, as I did the Abtei Muri, Tiefenbrunner or Waldgries wines. The Lavis wine, though, has a nice balance on the palate of fruit, acidity and mild tannins. Its flavors, as well, are much more showy than the nose. It's fruity, berryish and bright on the palate. Nice blackberry fruit and mild tannins...and it's the least costly wine of the tasting! One-and-a-half stars.